My first Vacation to the Black Hills. We stayed in a cabin by Lead, SD. It was a nice cabin and Me, Nathan and Mitchell had plenty of room to play. 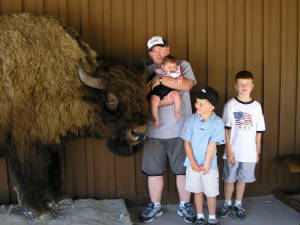 On our vacation we went to Wall Drug, Devils Tower, Crazy Horse, Story Book Island, Crystal Caves and had supper one night in Deadwood. It was fun and I can't wait till our next vacation. This is are first day of Vacation and my first time seeing a buffalo. We stoped by Wall, SD on our way to the Black Hills. Daddy didn't want to stop but Mommy did so we did. Mommy was taking the picture. 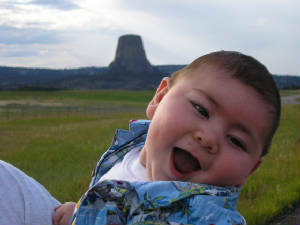 We also went to Devils Tower. It was just Mommy, Daddy, me and my brothers that went. We walked around it, I did't, I was in the stroller and slept about half the time. Last year I was in mommies belly so they didn't walk around it because mommy counld't walk very far. It was really nice out it wasn't to hot and it rained just a little. It is one of mommies favorite places to go because she always went there on her vacation with her grandpa and family when she was little. It was kind of a longer drive to get there but we had fun. We also saw some Pretty Dogs (Prarie Dogs) Mitchell started calling them that last year on vacation so now that's what everyone calls them. Click here to see pictures from the HPE Family Weekend! !